Here’s a book on prayer from the 1800s. I read once sometime ago that Peter Masters recommended the book and said it was “once enormously popular.” My copy includes a quote from Spurgeon saying the author “seems to truly and completely know the power of prayer.” It seems this book fell off the map for decades. Used copies can be found and Solid Ground Christian Books has a beautiful paperback volume in print now for an economical price. Check solid-ground-books.com. I have at least 20 volumes on prayer in my library and nothing quite moved me like this one. As a young Christian John R. Rice’s Prayer: Asking and Receiving helped me as did R. A. Torrey’s volume on prayer. 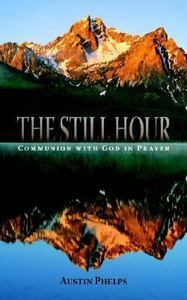 Mrs. Rosalind Goforth’s volume on How I know God Answers Prayer is not to be missed as well. “The Still Hour” is a book, though, I wonder how I missed all these years. Read it at your own risk. I was greatly convicted and concluded I didn’t pray at all. and many more. It’s only 136 pages, but a phenomenal read. Honey,This is a wonderful idea! I love it and am proud of you for doing this. I know you are already a tremendous resource for others about books and so I am excited about the possibility of helping many more people to know what books are good – especially those in the ministry! I love you! !